However, it’s a pretty safe bet that Bill Belichick will not be sending such a card to Adam Thielen. About halfway through the fourth quarter of Sunday’s game between the Vikings and the Patriots, Minnesota converted a fourth-and-one as they were driving to erase New England’s two touchdown lead. After the Vikings Latavius Murray picked up the first down, New England’s Patrick Chung went down as if he was injured. That “injury” allowed the Patriots time to review whether Murray had actually gained the necessary yard for the first down. After seeing the replay, Belichick threw the challenge flag. 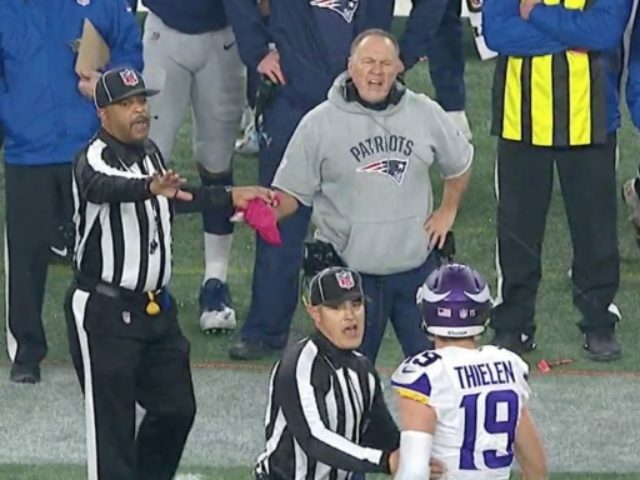 After throwing the challenge flag, Adam Thielen let Bill Belichick have it. “That’s bullsh*t!” the Vikings receiver shouted at the future Hall of Fame coach. The Vikings won the challenge, but the Patriots won the game, 24-10.